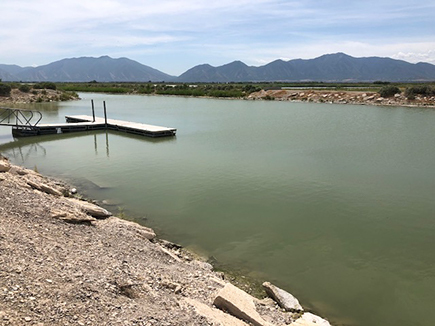 The Utah County Health Department (UCHD) closed the Lincoln Marina on June 29, 2018, due to exceptionally high cyanobacteria cell-count concentrations. UCHD also posted Danger/Closure signs in the Lincoln Beach area of Utah Lake. Swedes Access (Provo Bay), the State Park Day Use Area, and Sandy Beach areas continue to be under a Warning Advisory. The situation at Lincoln Marina has worsened considerably since last week, with cell-count densities in the June 25, 2018, sample containing concentrations 14 times greater than the June 20, 2018 sample. Cell-count concentrations at Lincoln Marina currently exceed the recommended recreational health-based threshold for a DANGER advisory. In addition, enzyme-linked immunosorbent assay (ELISA) toxin testing by the Utah Department of Agriculture and Food (UDAF) lab showed microcystin levels of >500 µg/L after a 100x dilution. Toxin levels could prove to be even higher after further dilutions. Toxin test results from the UDAF lab for samples collected on June 25, 2018, showed high levels of microcystins at Swedes Access and Sandy Beach and extremely high levels of microcystins at Lincoln Marina. Microcystin values for the June 25, 2018 sample in Lincoln Marina may increase after further laboratory dilutions/analysis. Dolichospermum, a particularly toxic cyanobacteria, was the primary cyanobacteria genus present in the samples. Dolichospermum made up 98 percent of the Lincoln Marina sample, which explains the extremely high toxin levels found in the June 25, 2018, sample. All cell-count concentrations exceed the recommended recreational health thresholds for a Warning advisory, and Lincoln Marina cell-count concentrations exceed the recommended recreational health-based threshold for a Danger advisory.